Some breweries make hops shout, Oakham make them sing. 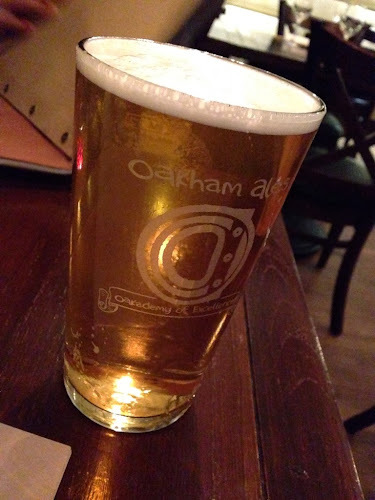 Pulling off that elusive combination of extreme hoppiness and effortless drinkability, Oakham beers are so much more than hop bombs, they have a freshness which allows the flavour of the hops to really shine. 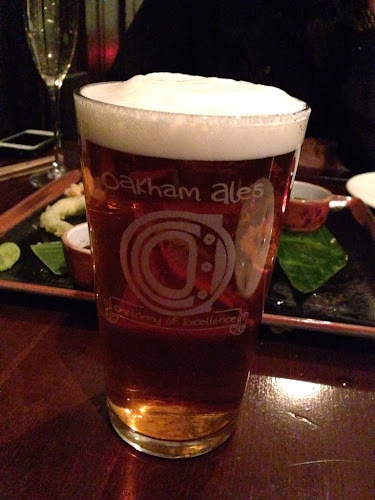 So, when I heard about Oaka in Kennington, the newest Oakham Ales restaurant, I was more than a little bit intrigued. It opened in March this year and is Oakham brewery’s first venture into the capital, taking the tried and tested pub-with-a-thai-attached to a whole ‘nuther level. It’s a similar combination to the excellent Brewery Tap in Peterborough, their brewpub I visited a couple of years ago. The first thing you notice when you walk into Oaka is the polished-ness of everything. It looks like an upmarket thai restaurant rather than a pub - that said, the welcome is warm and there’s just as many people in for a pint as a pad thai. I started off with a cracking pint of their Inferno Pale ale, a beautifully bitter and citrussy four percenter that punches way above its weight, and which worked great with the sweet and spicy curried pumpkin gyoza I had to start. 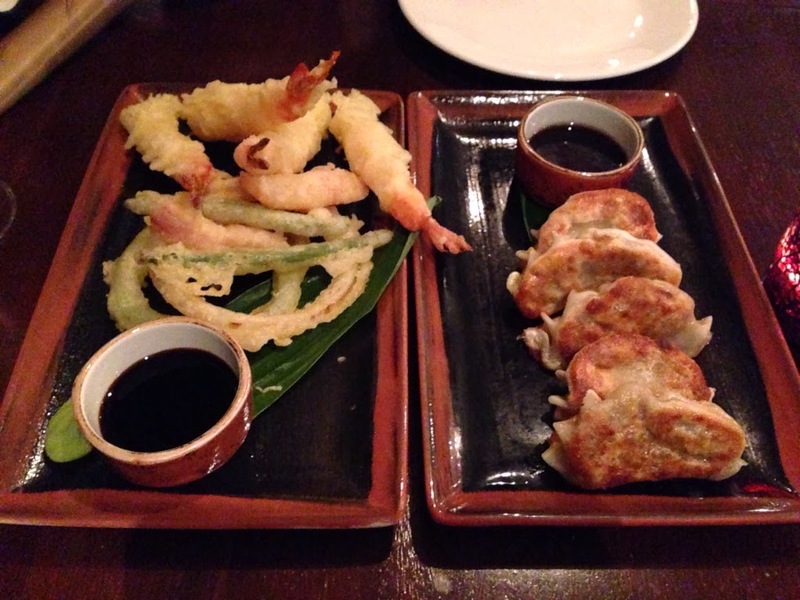 The tempura prawns were light, crisp and faultless. We ordered a couple of main dishes to share, in an effort to do the menu justice. 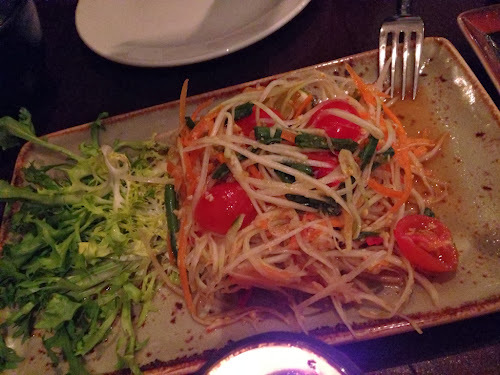 The best of the bunch was a perfectly balanced Som Tum salad of thinly sliced green papaya, chilli, lime, peanuts and fish sauce. It’s one of my favourite dishes when done as well as this, adding much needed freshness to your plate and offsetting the rich fattyness of the roast duck red curry and aromatic soy braised pork belly we ordered too. The pork was simplicity itself. 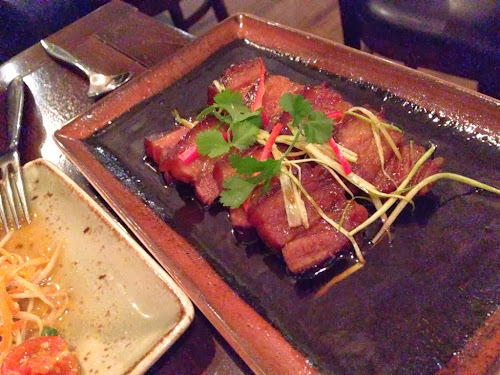 Well cooked, well seasoned pork belly slow braised with soy sauce, chilli and palm sugar until it’s as richly flavoured and tender as is humanly possible. Umami on a plate and a perfect counterpoint to the hot and snappy papaya salad. The duck was tasty enough, but I was expecting a thicker, richer curry than the one that arrived – which was just a touch thin I thought. Still, a minor stumble in an otherwise faultless meal. The coconut rice was as sticky and moreish as you'd expect. Alongside the mains I tucked into Oakham’s new seasonal beer ‘Asylum’, a pale amber beer which has the hops dialled back somewhat compared to the likes of Inferno or Citra, but which again managed the effortless drinkability I’ve come to expect. Speaking to the chap behind the bar I narrowly missed an opportunity to try a rare dark beer (Oakham’s Porter) from this brewery who are known for their pale and hoppy beers. The regulars must’ve rated highly too as it was gone as quick as it came. If you’re looking for somewhere to eat quality pan Asian food and drink some of the best cask beers in the country, then Oaka is pretty much without competition. I’ll be back again soon.